SAINT PETER, Minn. – The Gustavus Adolphus College Athletics Department has chosen nine individuals for induction into its Athletics Hall of Fame. The 2018 inductees include Renee Beaudry ’03 (Soccer), Eric Butorac ’03 (Tennis), Meghan Donley ’00 (Tennis), Ryan Hoag ’03 (Football, Track & Field), Luke Speltz ’03 (Track & Field), Andy Traetow ’03 (Football), Jerry Washington ’03 (Track & Field), Kevin Whipple ’03 (Tennis), and Al Molde ‘66 (Benefactor). This group will be honored at the Athletics Hall of Fame Banquet, which will be held in Alumni Hall on Saturday, Oct. 6, following the Homecoming football game against Concordia College at 1 p.m. 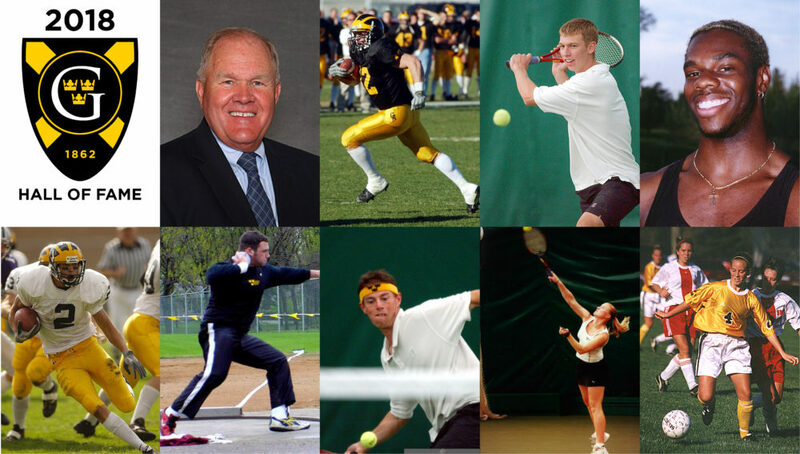 Individuals eligible for induction into the Gustavus Athletics Hall of Fame are athletes, coaches, and benefactors. Selection of athletes is based on athletic achievements while a student at Gustavus. Eight of the nine members of the Gustavus Athletics Hall of Fame Class of 2018 will be inducted for their accomplishments as athletes, while one, Al Molde, will be inducted as a benefactor. Renee Beaudry, an Apple Valley, Minn. native, was the face of Gustavus women’s soccer at the turn of the century as a four-time All-Conference performer and two-time MIAC Player of the Year. Beaudry was twice named NSCAA All-Central Region First Team and ranks second in program history with 114 career points. Eric Butorac, a Rochester, Minn. native, one of the elite players in the storied history of Gustavus men’s tennis, was a five-time All-American and claimed the 2003 NCAA singles and doubles championships. Butorac also captured a runner up finish in the 2001 NCAA singles tournament and was the first recipient of the Gustavus Male Athlete of the Year that same year. Meghan Donley, a Duluth, Minn. native, earned three All-America honors while leading the women’s tennis team to three MIAC championships. Donley received All-Conference honors all three years she was on the team and finished 57-1 combined in MIAC singles and doubles. Ryan Hoag, a Minneapolis, Minn. native, excelled on the gridiron and the track as a student-athlete at Gustavus. Hoag ranks in the football program’s top-four in career receiving touchdowns, yards, and receptions after receiving two All-Conference honors. As a sprinter on the track, Hoag garnered two All-America honors and still holds three school records. Luke Speltz, a Rollingstone, Minn. native, one of the greatest throwers in Gustavus track & field history, was a six-time All-American and was named NCAA Indoor Championships Field Athlete of the Year in 2003. Speltz won 14 MIAC championships between the shot put, weight throw, discus, and hammer, and still holds three school records. Andy Traetow, a Jackson, Minn. native, earned All-America honors as a running back and return specialist for the Gusties. Traetow was also an exemplary student-athlete by earning Academic All-America honors his senior season. He was a three-time All-Conference performer and ended his career with nearly 5,000 all-purpose yards. Jerry Washington, a Fort Richardson, Alaska native, is the most decorated sprinter in Gustavus track & field history having earned All-America honors in the 100-meter three consecutive years. Washington won seven MIAC championships and still holds six school records. Kevin Whipple, a St. Cloud, Minn. native, one of the elite players in the storied history of Gustavus men’s tennis, guided the Gusties to four-straight top-four finishes at the NCAA Championships during his career. Whipple was a five-time All-American, won the 2003 NCAA doubles championship, and finished runner up twice in the NCAA singles championship. Al Molde, a Montevideo, Minn. native, was the Athletic Director from 1997-2012 and achieved unprecedented success during his 15-year career. The Athletics Department posted 14 top-25 finishes in the NACDA Directors’ Cup, highlighted by a sixth-place finish in 2002-03, and six MIAC All-Sport titles. Molde oversaw the construction of the $4.6 million football stadium in 2007 and started women’s hockey as a varsity program in his first year as athletic director. The selection of the inductees to the Gustavus Hall of Fame is made by the Gustavus Hall of Fame Board, which is an 11-member group consisting of current athletic administrators, and former coaches and alumni. Quite an impressive group. A well-deserved honor for each of the inductees. Congratulations to all of you! Congratulations to entire group. Thank you Al Molde.